First off, I’d just like to casually acknowledge that I’m not dead. So, that’s good. Still alive. But, if you follow me on Instagram, and watch my Insta-Stories, you might know that I happened to catch some sort of viral pneumonia situation, which at times, felt like I very well might be dead. Or, at least deliriously living in between a state of breathing and some sort of dark cough-prison where my bones weigh a million pounds and the Real Housewives of Potomac waxes un-poetically in the background. Do you understand the depths of Netflix garbage you can consume in a period of nine weeks of respiratory lock down? I pray you never have to know. So, I’m back just in time for spring to still be a thing. Sure, it’s given me pneumonia, and the most intense allergies of my life…but, it still busts out a good deal of asparagus. This is positive. This might make up for all of the coughing and the sneezing and all the eucalyptus oil I have huffed. Um, probably not. But, let’s just go with it. Spring tried to kill me, yet, I am still going to sing its praises. That’s just the kind of gal I am. Shall we pen a quick and precarious ode to late spring? Yes. Why don’t we. That seems sensible. Oh, SPRING! You sly, fertile mistress. You came at me with your ragweed lips, and kissed me. You quite literally took my breath away. Thank you, for the allergies. Thank you, for the pneumonia. Thank you, for the asparagus. Also, I like how early the berries be poppin’ this year, so thanks. Also, flowers. Peonies. You get it. Let’s do better next year. I don’t mind kissing, but you could leave your pollen dusted lip tint at home. Obviously, this is the peak of my poetry writing career, and the perfect place to stop. 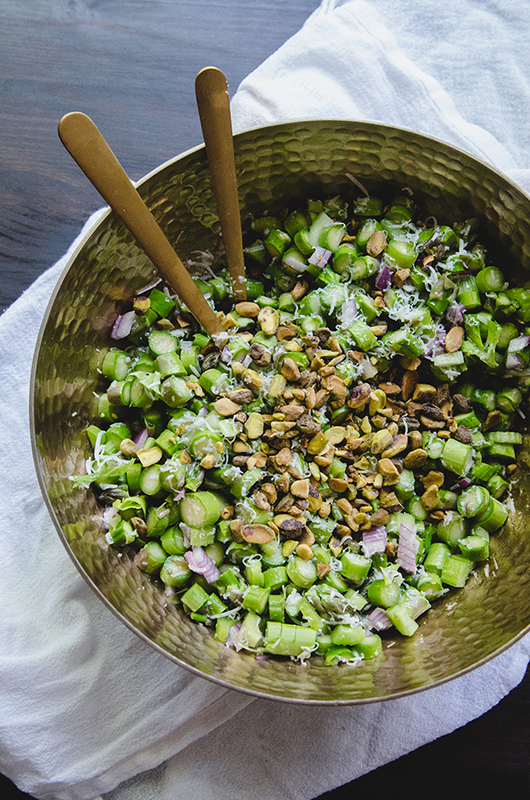 I hope you enjoy this simple raw asparagus salad! 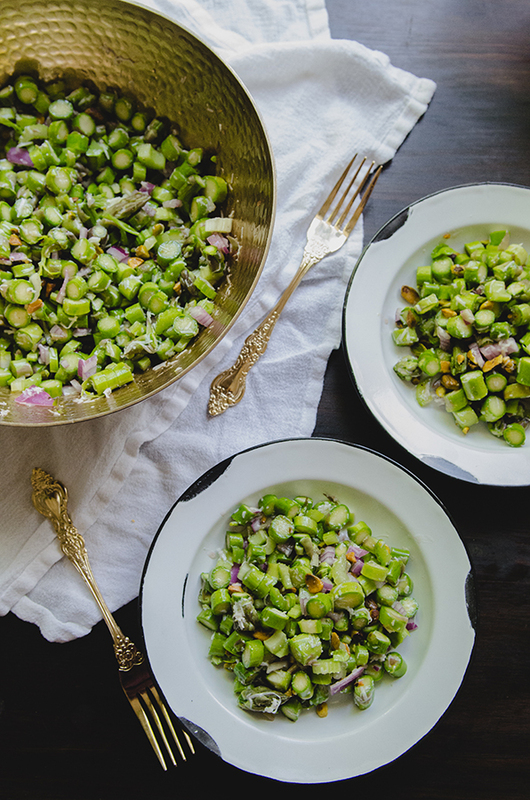 It’s crunchy, tangy, salty and a little sweet with the addition of the pistachios! It’s prime picnic food, if you have the will to survive seasonal allergies and dine alfresco. Serve it up with your favorite protein, and you got yourself a meal. Sing to it. Wink at it. Or, just simply eat it. Enjoy! Chop off the tough ends of the asparagus and discard. Now, chop the asparagus and add it to a large salad serving bowl. Do the same with the celery. Finely chop the red onion and add that to the bowl as well. Make the dressing my combining the avocado oil, red wine vinegar, salt and pepper. You can do this by whisking the ingredients together, or by adding everything to a pint sized mason jar with a lid and shaking until it's combined. Pour the dressing over the veggies and toss them well. 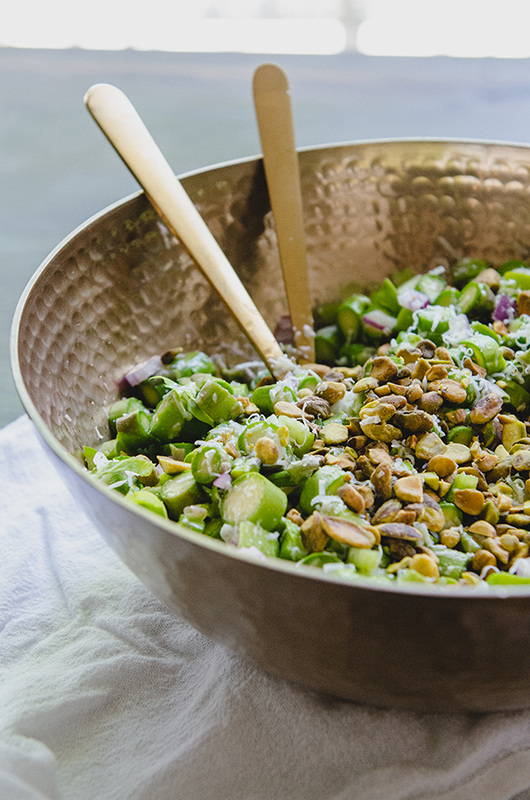 Top with the finely shredded pecorino, and pistachios. Toss and serve! Enjoy! Not into cheese? Leave it out. It will still taste awesome! I for one am glad you are alive. 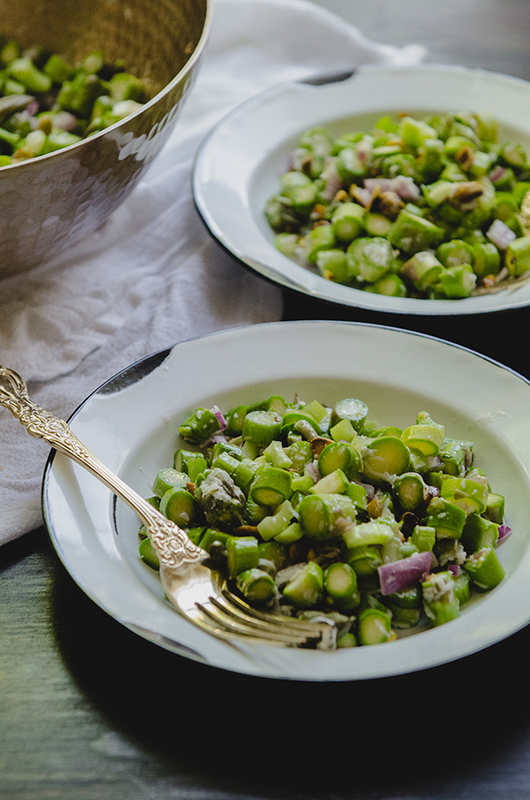 This asparagus salad looks so good! Haha. Thank you, Kelli! Super glad your’re alive too—even though Spring didn’t try to murder you. Just grateful all around.